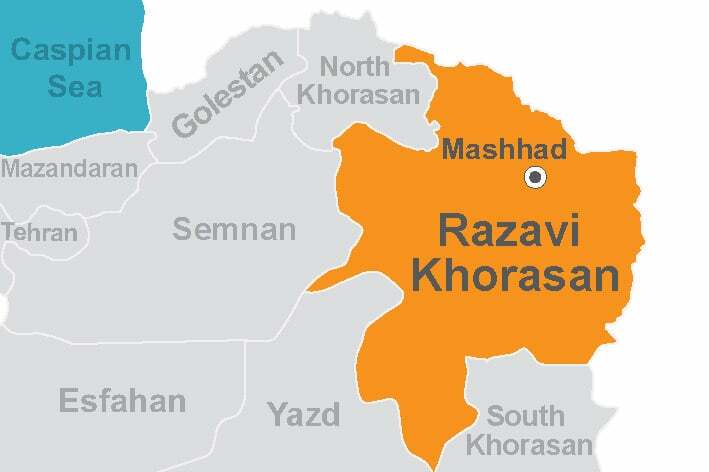 Razavi Khorasan Province has an area of about 118851 square kilometers located in northeast of Iran. It is the fifth province of the country in the term of size. It neighbors South Khorasan, Semnan, North Khorasan and the countries of Turkmenistan and Afghanistan. It has 28 counties and Mashhad is its center which is the second populated city of Iran, the first city is Tehran. Different Iranian folks inhabit in this province and the common language is Farsi. The province is almost entirely surrounded by mountains and its highest peak is Binalud. The province enjoys dry and semi-arid climate but in the mountainous areas, the winters are cold and summers are mild. In the region with low height, winter is almost cold and summer is hot and dry. The Grand Khorasan covered south of Amu Darya and large parts of Central Asia countries. During Sassanid Dynasty, Khorasan was ruled by a Spahbed (army chief). It had the four main cities of Islamic era: Nishabur, Marv, Herat, and Balkh and each of them were separately the center of Grand Khorasan in different eras. Al-Ma’mun, the Abbasid Caliph, appointed Tahir ibn Ḥusayn as the governor of Khorasan, but in less than a year Tahir announced independency from Caliph and transferred the capital of Grand Khorasan from Marv to Nishabur and ended the absolute dependency of Iran to the Arab Caliphs. In Samanid Dynasty, Khorasan and Mā warāʼ al-Nahr (Transoxiana) were among the brightest regions in history of Iran known for the flourishment of science, literature and Persian language. When the Turks of Ghaznavid dynasty came to throne and took the ruling of the area, one of the most important events of the region’s history took place and that was the breakdown of Grand Khorasan and as a result, a great section of the province with the centrality of Ghazni (Afghanistan) remained under the rule of Ghaznavid, and the rest of it was governed by Seljuk dynasty. During Mongol invasion, Tamerlane from Samarkand attacked Khorasan four times. Later Grand Khorasan became part of Safavid territory and finally Nader Shah chose Mashhad as capital. After his death Khorasan came under the control of Afghan commander. Agha Muhammad Khan Qajar took the full control of Khorasan without war and bloodshed and after that Grand Khorasan was completely ruled by Qajar dynasty. The biggest and most glorious mausoleum of Iran is holly shrine of Shiite eighth Imam, Imam Reza (peace be upon Him) which is located in Mashhad city. Millions of both local and foreign pilgrims and tourists travel to Mashhad every year to visit him. 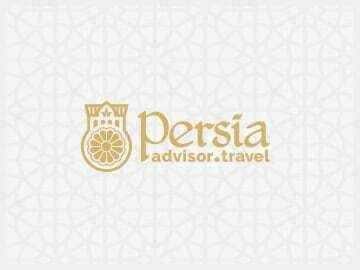 In addition to the magnificent complex of Astan Quds Razavi (including the Imam Reza holy shrine, Goharshad Mosque, Golden Arch, Allahverdi Khan Portico, Shah Mosque and Bathhouse, and Anthropology Museum), there are some other tourist attractions of Razavi Khorasan is the Ancient Windmills of Nashtifan, Robat-e Sharaf Caravanserai, Tomb of Ferdousi, Nadir Shah Afshar, Farid al-Din Attar, Omar Khayyam and Kamal-ol-molk. It is worth mentioning that Gonabad Qanat has been inscribed on UNESCO world heritage list. Some handicrafts of the province include Carving on Stone, Pottery, Turquoise Stone, Silk Weaving, Barak Bafi, and Furrier. The important souvenirs of province are Saffron, Barberry, Pomegranate, Spices, Perfumes, different types of Nabat, Prayer Rug, Turbah, Misbaha, rings and jewelries and Carpet. Shashlik, Shol-e, Eshkaneh, Dizzi Sangi and Balghur Aash are among local foods of the province. Ferdowsi Tosi (Epic Poet), Farid al-Din Attar (Mystic and Poet), Omar Khayyam (Poet), Kamal-ol-molk (Painter), Jaber-e bin Hayyan (Alchemist, Mathematician), Mohammad-Taqi Bahar (Poet), Dr. Ali Shariati (Sociologist), as well as Mohammad Reza Shajarian (Traditional Singer) are among notable figures of Mashhad. 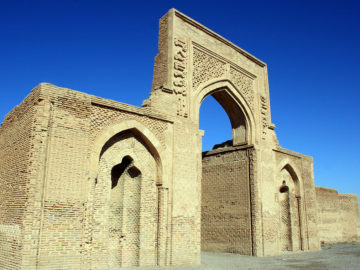 Robat Sharaf, or Sharaf Caravanserai, is an important historical place that dates back to the late Seljuk era. It is located in the eastern part of the Red Road in Khorasan Razavi province. Sarakhs is a city and capital of Sarakhs County, Razavi Khorasan Province, Iran.